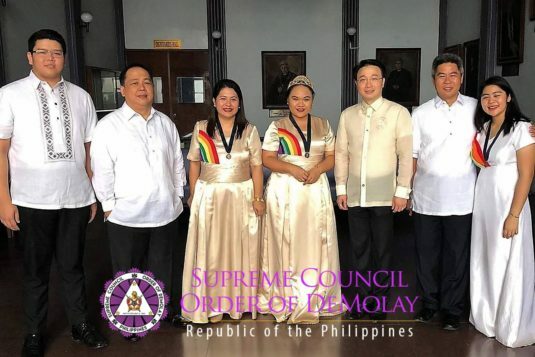 Sis Karol Joseffe Borja, Grand Worthy Advisor, Grand Assembly of the Philippines, International Order of the Rainbow for Girls, and Sis Kimberly Tandoc-Borja, Grand Mother Advisor, Grand Assembly of the Philippines, invited Hon. 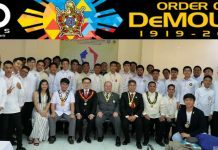 Edison Abella, Grand Master of the Supreme Council, Order of DeMolay, as its Guest of Honor and Inspirational Speaker during the General Assembly of the Philippines of the International Order of the Rainbow for Girls, hosted by Perla Assembly No. 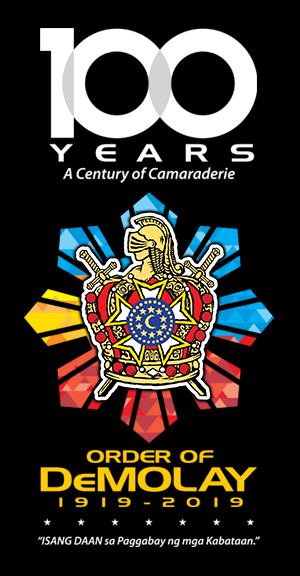 1, held on July 21, 2018 at the Scottish Rite Temple in Malate, Manila. 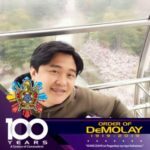 “One of the seven cardinal virtues of the Order of DeMolay is filial love. We are exhorted to give importance to the family by respecting and obeying our parents. 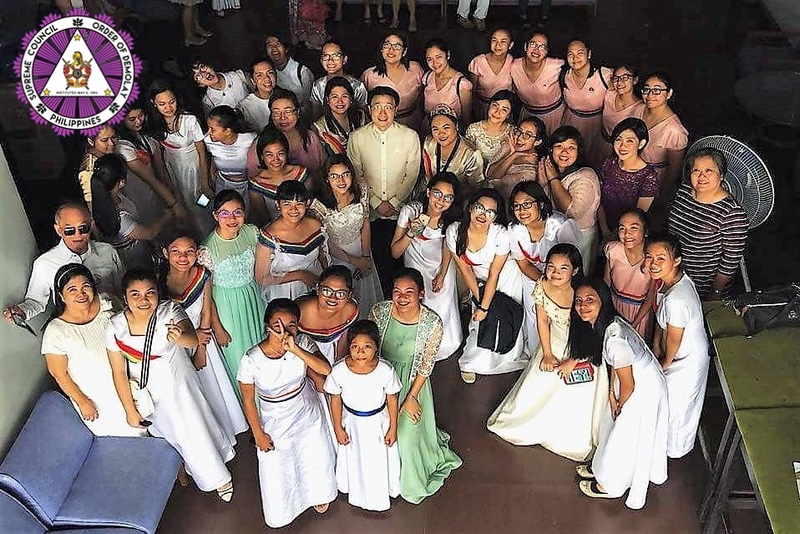 Our traditional Flower Talk refers to filial love as “the virtue that has been given first place among the jewels adorning the Crown of Youth”. Also, our Code of Ethics commands us to honor womanhood. 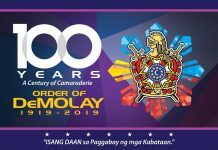 As we realize the important duty of honoring our mothers and women, we young men of DeMolay also recognize the value of honoring our fathers, the pillars of our home, ang haligi ng tahanan. In our Father’s Talk, we pay tribute to our fathers as the source of our strength, the persons we want to emulate, the men who guided us when we were growing up and molded us to become good sons and better human beings. 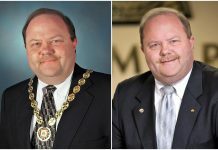 Although our official Father’s Day was last June 17th, I firmly believe that every day is an opportunity to celebrate Father’s Day as we continuously thank and appreciate our fathers for the love and care we receive from them. To our Rainbow girls and sisters, some of us fathers may seem too busy or look strict, but our hearts melt when you remember to text or PM us to ask if we already ate lunch, or give little notes or cards thanking us for your allowance, or leave a stuffed toy on our desks to let us know that you are thinking of us. These are ways to show your appreciation for the nights that we worried that you were late coming home; or for waiting in the car while you were having fun at your J.S. Prom; or for forgiving us for raising our eyebrows when you first introduced your boyfriend. I would also like encourage each one of you to pray for the fathers in your family every morning when you wake up, whether he is your father, brother, father-in-law, brother-in-law, grandfather or step-father. Thank God for their life, love and sacrifices, for their leadership, integrity, instruction and discipline. Ask God to grant them wisdom, protection, favor, strength, good health, wealth and happiness. Sa aming mga tatay, malaking bagay yung simple gestures na ito at siguradong matutuwa kami at makakatanggal ng pagod sa araw araw na pamumuhay. Do you know what the Fifth Commandment in the Bible is? The Fifth Commandment is “Honor your father and mother; that your days may be long in the land that the Lord your God is giving you.” Can you recall the other 10 Commandments? Note that the Fifth Commandment links the first four Commandments with the remaining five. The first up to the fourth Commandments teach us how to love and respect God while the fifth to the tenth Commandments instruct us on how to love and respect our fellow man. We can learn to obey the sixth to tenth Commandments only when we abide by the Fifth Commandment to honor our parents, for our parents are our first role models in establishing social relations with other people. It is also the first Commandment with a promise: “Honor thy father and thy mother: that your days may be long in the land that the Lord your God is giving you.” God promises a long and prosperous life for those who respect their parents. 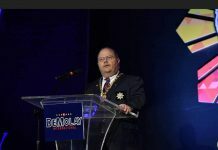 In closing, I would like to commend all the fathers who are present here and even those who were unable to come. Thank you for leading your family and directing your children in the ways of the Lord.